Before we left for our trip to Mozambique, there was flooding at the Zambezi river and it was the first question (just about) that everyone asked me when we got back ... "Were you affected by the flooding??" 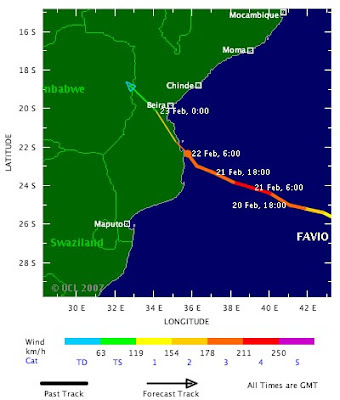 "The National Meteorology Institute, INAM, said Favio's strong winds and rains were concentrated in the province of Inhambane but were felt as far away as Xai-Xai, the capital of nearby Gaza province." "The cyclone has caused widespread damage at the holiday resort of Tofo Beach, uprooting palm trees and destroying electric pylons around the area which has become a favourite of backpackers and scuba divers, Radio Mozambique said." Inhambane & Tofo both affected badly ... that's exactly where we were less than a week ago! Yikes.